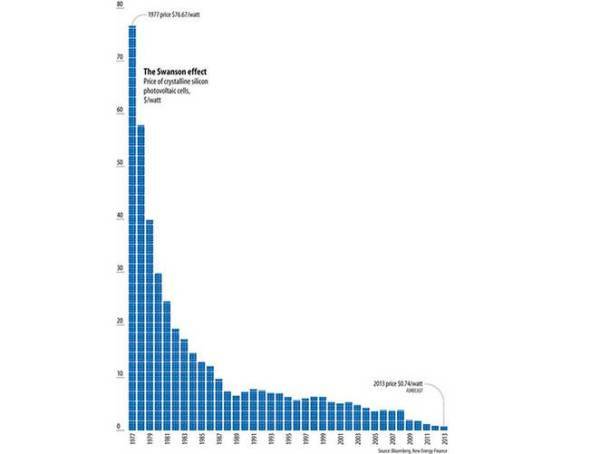 Solar panel costs have never been lower than right now! Spurred on by falling technology and installation costs, the time to go solar is now. Below we explore the average cost of solar panel installations, just how far prices have dropped, and what factors do you need to consider before calculating the costs of going solar. For a quick personalized estimate to see how much solar panels cost for your home (and how much you can save with solar panels) enter your zip code below. When most people talk about ‘solar panel costs’, they’re not talking about how much the solar panels themselves cost. Instead, most of us want to know how much an entire solar installation costs, including the solar panels, wiring, inverter, labor, and everything else you need to get you running off the sun. As of 2018, you can expect to pay around $3 per watt before applying any incentives. With the average home installing a 5,700 watt system, that equates to about $17,100 for an average-sized solar installation, before incentives. That before incentives bit is important, as all the tax credits and rebates that are available can significantly drop your total cost to go solar. Back in the early 2010s, state, local governments, and utilities across the country offered incentives to encourage homeowners and businesses to install solar. You could shave off a lot of your total installation costs simply through all these incentives! However, as more and more homeowners took advantage of these offers, they began to dwindle. Today in 2018, many of these state and local incentives have already dried up, but they’re not completely gone! A handful of cities and states still offer tax credits and/or rebates, and the federal government still offers the Investment Tax Credit, one of the best incentives around and worth 30% of your total installation cost. However, even this one won’t last forever. Congress already extended it once, and it’s set to completely run out in 2021, so if you’re looking to go solar, better now than later! With a 30% tax credit, that $17,100 installation works out to $11,970 – not a bad discount. Of course, it’s unlikely your solar installation will come in at exactly $17,100. It’s hard to calculate exactly how much your solar installation will cost, as each homeowner’s property, roof, and energy use is completely different. Homes can be big or small. Homes can be just a couple or 3 generations all under one roof. Typically homeowners size their solar installation to cover most or all of their energy use, so you could live in the exact same house as your neighbor next door, but need completely different solar installations if you’ve got 5 people in your home and they’ll only got 2 – your energy use will obviously be much higher than theirs! And maybe you’ve got a big family and a big house, so you use a lot of energy, but you can’t install on most of your roof because it’s not facing the right direction or there’s a beautiful, big tree shading most of it. Your installer can estimate exactly how that shade will affect your total production and cost-effectiveness. That’s why most installers always start by sending a salesperson or technician that can quickly assess your roof and energy use and then give you a rough estimate of your savings. With so many different living situations that affect energy use, and with every home being so different, getting a quote from an installer – face to face on your property – really is the best way to find out how much you can save going solar. Compared to 40 years ago – or even just 4 years ago – the price of solar has plummeted, mostly due to falling panel prices. As mentioned, the average solar installation costs around $3.00 per watt. Can you guess how much solar cost in 2009? Got your answer? A shockingly high $7 per watt! So in these few short years, the price to install solar dropped about 60%! Researchers from NREL found that, from 1998 to 2013, the cost to install residential solar declined 6% to 7% per year. That trend continues today, with the average price continuing to drop 7% from 2016 to 2017. You might be asking yourself now, “Well, shouldn’t I just wait until the price drops even more before installing solar?” That’s a good question, but it’s really like asking if you should wait until next year to investment in the stock market. No one knows the future, and while you’re waiting, utility prices are also increasing,cancelling out those cost savings you’d see later on. Prices and technology are constantly changing, but installing solar right now is a good financial decision. If you look closely, you’ll see that in 1977, solar panels cost $77 per watt. How about in 2013, the last year shown above? That’s right, $0.64 per watt! Compared to the ’70s, solar panels today seem dirt cheap! Fast forward to 2018 and solar panel costs have dropped even further, to just $0.35 per watt – quite literally slashed in half in just 4 years. And of course, while the panels make up just a fraction of the total installation cost, their amazing cost decrease is partly what spurred on the solar explosion we’re enjoying today. Even with these falling prices and great incentives, solar is still a pretty big investment. If you want to be the smartest solar buyer around, here’s a few tips to make sure you get the best deal. You might be surprised, but installing solar is not the most cost-effective way to save on your energy bills! What is? Energy efficiency! 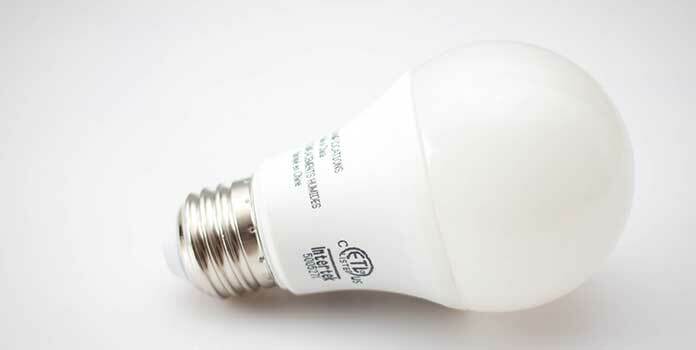 It’s certainly not as fun or cool as solar panels on your roof, but installing additional insulation in key areas, weatherstripping around doors and windows, installing a few energy efficient appliances, and replacing all your old incandescent light bulbs with LEDs are cheap ways to save a lot of energy. In fact, consider installing as many energy efficiency updates as possible before even looking at solar. This lowers your energy use and allows you to install a smaller solar installation, saving you cash from the get-go. Don’t know where to start? Many utilities will give you rebates for performing an energy audit, where a technician walks through your house and tests your doors, windows, and appliances to see how they affect your energy use. They’ll then provide you an itemized list of recommendations to cut your energy use. Just like any home improvement project, talking to a few different installers is a great way to get the lay of the land. You’ll find out what equipment is available, what services they offer (some installers offer roof repair/replacement at a discount when you install solar), and what costs are out there. In fact, in a 2017 study the National Renewable Energy Lab found that smaller installers typically charged about 10% less than big installers like Sunrun and SolarCity. With that in mind, be sure to gather quotes from both large, nation-wide installers and smaller local companies. National installers can buy in bulk and streamline their processes, but local installers lack the overhead the plagues this big companies. Paying in cash is the single best way to save thousands of dollars on your solar installation. As we learned above, even just 10 years, solar installations were prohibitively expensive and only homeowners with a deep bank account could really afford to pay outright for one. Then, around 2008 solar installers began offering solar leases to allow homeowners to avoid that high initial investment. The solar industry exploded thanks to this new financing mechanism and the majority of solar homeowners taking advantage of this option. However, as solar panels and installation costs continued to drop in price, more and more homeowners are now able to pay upfront in cash for their solar installation, savings quite a bit on interest, leasing fees, and all the other expenses leasing requires. If you want to save as much money as possible, pay in cash! This is obviously a no-brainer, but financial incentives drop the cost of solar dramatically and many organizations offer them, so talk to your installer and do some research to find as many as possible. To begin with, the federal government offers a 30% ITC (Investment Tax Credit). This tax credit – not a deduction – is equal to a dollar-for-dollar discount on your total installation. Unfortunately, this is a non-refundable tax credit, so you won’t get paid out if you owe less than $0. However, you can break down the total and claim a portion over several years if you don’t owe enough in the first year alone to take advantage of the entire amount. Some states and cities still offer incentives and rebates, so check your local resources as well. These are often tax credits similar to the federal tax credit but can include rebates, property tax exemptions, and sales tax exemptions as well. Municipal governments and local utilities can also offer rebates, performance incentives, and net metering to further lower your total investment going solar. Your best source for information on rebates and incentives is your solar installer, as they’ll know exactly how to maximize your incentives. You can also check out the DSIRE (Database of State Incentives for Renewables and Efficiency) to find incentives that are available in your state – though be warned that it can make for some dry reading. Solar is all about the future. You invest now and over the next 25 years make your money back and save some serious cash. With this in mind, reading and understanding all the financial estimates is a worthwhile, nay mandatory, endeavor. Basically, you want to ensure that you’ll spend less money by installing solar than if you continued to purchase all that electricity from the utility over those 25 years. Estimates typically include colorful graphs that break down your future usage, avoided utility cost, solar electricity production, and yearly savings. But don’t just take their word for it! Compare each company’s estimate to the other estimates you received. Even take time to calculate the savings estimates yourself. Take a look at our article An Overview on Solar Panels ROI to learn how you can easily calculate your solar installation’s long-term savings. With solar, ensuring you get a great deal is all about knowledge. Know what you’re getting into before signing that paper! Of course, on the flip side, there are options and factors that can increase your overall expenses. Every building is different and there can be incidental costs. Let’s talk about what you need to look into before installing a solar system and what it might cost. Going for high efficiency solar panels or newer Tesla products can add costs above and beyond what we’ve listed here. We’ve written extensively about these in other posts. If you’re interested in Tesla’s solar tiles, check out Tesla Solar Roof Tiles Cost vs Solar Panels. If you want the best products available, we outline what’s out there in What are the Most Efficient Solar Panels. The vast majority of homeowners will be just fine with run-of-the-mill, standard solar panels. Installers typically install these standard panels, as they strike a good balance between efficiency, durability, and cost. Of course, there are exceptions. If you live in a particularly extreme environment with heavy snow or extreme temperature fluctuations, installing an ultra-durable panel might make sense. If you have very little roof space, buying premium, high efficiency panels will allow you to produce more electricity in that small space. Just be sure to closely watch your savings estimates to make sure these premium, higher-cost products make financial sense. Financing your solar installation through a loan or lease adds cost. While you don’t have to shell out the thousands of dollars to purchase the installation outright, the return on your investment also won’t be as high. Just as an example, let’s say you took out a 15-year loan with 5% interest to pay for your $17,100 solar installation, you’d add about $7,000 to your total expenditure over the next 15 years. Installing solar is still a sound financial investment, and people finance their installation every day, but you’re not saving as much as you could save. If you are going to finance your installation, loans generally make more sense financially, though that’s not always the case. If you go with a loan, then you own the equipment and you have all the rights to it. You also benefit directly from any incentives you’re eligible for. On the other hand, if you lease the equipment, you don’t own it. You don’t get to benefit from tax incentives and you cannot sell the system along with your home if you move. You’ll have to transfer ownership of the solar lease to the new homeowner or just buy the whole system outright. Both leases and loans still allow you to save, but you need to choose your agreement carefully as interest, the length of lease or loan, and any additional fees all affect your savings. While a reroof isn’t really part of a solar installation, if your roof shingles or tiles aren’t in good shape and you think you’re due for a replacement in 5-15 years, it’s definitely in your benefit to do so before you have solar installed. The cost to remove your entire solar installation and re-install it on your new shingles is typically in the thousands of dollars and you should try to avoid that additional expense if at all possible. Besides assessing your shingles or tiles, respectable solar installers will actually go inside your attic and check your roof and joists for any water damage or heavy wear. If they find anything unusual, they’ll discuss all issues and solutions before starting the solar installation. If there is a problem, sometimes you can get away with only replacing a small section of your shingles, while other times a complete reroof makes more sense. Your out-of-pocket costs will depend on how much needs to be done as well as the materials you choose. Your cost for a new roof will depend on the square footage that needs to be covered. Homewyse estimates that for an asphalt shingle roof, you should expect to pay around $3 to $4 per square foot. So, if you need a 200 square foot expanse of roofing replaced with shingles, then you can expect to pay between $600 and $800. Installing new shingles on your 1,200 square foot home would cost between $3,200 and $4,000. Obviously, this price goes up if you go with more expensive materials. Asphalt or composition shingles are the cheapest, with tile and metal costing significantly more. How much you choose to invest in your new roof may also depend on how long you plan to be in the home. Asphalt shingles will usually last at least 20 years. Metal and slate are good for 50 or more, so when considering your roof as part of your solar panel cost, keep this in mind. If you find out you need to install new roof shingles before going solar, it’s something you would’ve had to do anyway at some point in the future, so you might as well do it now and get that solar installation pumping out electricity as soon as possible! 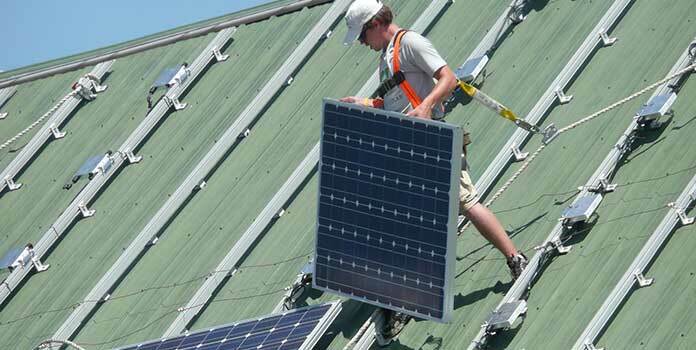 The vast majority of homeowners install their solar panels on their roof. It’s out of the way and easy to install. 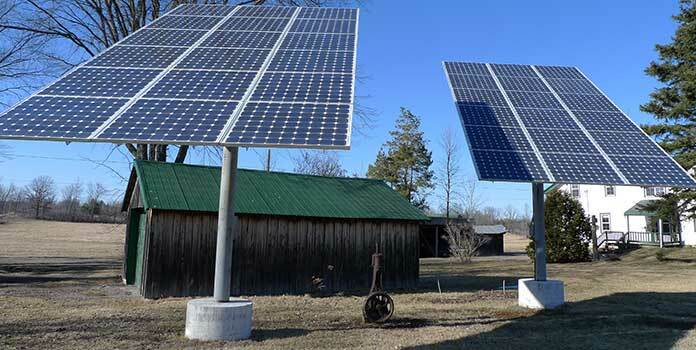 However, if you lack the roof space, you can also mount your solar panels on the ground. If there are a lot of obstacles on your roof (chimneys, antennae, vents, and so on) or heavy shading then rooftop installation could be problematic. Maybe you’ve already installed solar on your roof and what to expand your energy production, but don’t have enough space. In these situations, a ground-mounted system might be your only recourse. Ground-mounted systems are more expensive, but if you don’t have roof space they are certainly an option. Battery backup is becoming increasingly popular for solar installations, as battery costs continue to fall and utility prices continue to increase. Obviously batteries add cost to your solar installation – a big cost. The Tesla Powerwall, which both SolarCity and Sunrun currently offer as battery backup for their solar installations in Hawaii and California, costs $5,900. The Powerwall can save 14kWh of electricity for later use, about enough electricity for one day for most households. Battery back-up makes sense where utility rates are very high and the additional cost of purchasing and installing batteries is still cheaper than buying electricity from the utility (again, think Hawaii and California). If you live in an area with very bad weather and an aging utility infrastructure (old poles, lines, etc) that frequently goes down, you might be interested in battery back-up no matter what the cost, especially if you’ve got sensitive machines that need constant power (like certain medical devices). You’d certainly enjoy some serious perks from battery back-up, but you might not be able to recoup your investment if you live outside certain areas. As research continues into energy storage, the solar system cost including storage will likely also become considerably lower. If it’s too expensive now, you can easily add a battery down the road, after you’ve installed your solar system. Maintaining the installation is a cost many people forget about, but it’s just as important as that upfront installation cost. If something breaks 10 years down the line, you’ll have to take care of it right away to get the installation pumping out electricity again. Your solar panels and inverter – the two biggest equipment expenses for your installation – typically have long-term warranties. 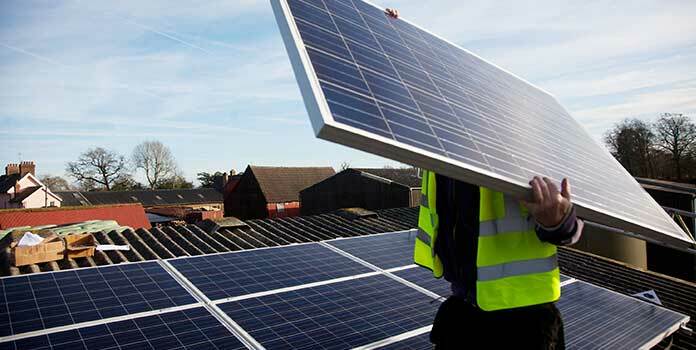 Solar panel manufacturers provide 12 to 15-year equipment warranties and 20 or 25-year production warranties (basically ensuring that each year the solar panel will produce a high amount of electricity). Inverter manufacturers typically provide shorter warranties, about 10 to 12 years, for their products. Some experts recommend adding in a couple thousand dollars to your lifetime expense estimates to account for your inverter inevitably failing. This is probably a good idea if you want the most accurate savings estimate possible. Talk to your installer to see if they add this expense into your estimate. Some people also like to clean their solar panels to make sure they are pumping out as much electricity as possible, but unless you live in a very dusty state with little rainfall, there’s really no need to clean your solar panels. The glass coating is very slippery and ‘self-cleans’ the panels when it rains. If you’ve gone a few months without rain and you’re starting to notice that they’re pretty dirty, grab a hose and just spray them down. Don’t pay a company to come clean them for you, as the additional electricity your newly clean panels will produce won’t cover the investment of the actual cleaning service. So, how much does it cost to install solar panels? It all depends on your situation. If you’ve got a big house with lots of kids running around, you’ll need a bigger installation than a retired couple in a small garden home. And if you take some time to install energy efficiency measures and shop around, your costs could be even lower. The best first step is to simply have a few installers visit your home, inspect your roof, and look at your energy use. This will give you a much more accurate savings estimate than any general calculations we could do here! If you are willing to make the initial investment, you could save a great deal of money over the next few years and reduce your carbon footprint at the same time. So get on it!